Chinese symbolic motifs were invariably representational, depicting things in a convincingly naturalistic way. Even those elements from the imaginary world of myth were given recognizable substance. Few symbols in Chinese art were abstract, although many of the ideas they represented were less than concrete. Symbolic motifs fall into five categories. The largest number were taken from the natural world. Flowers, animals, birds and insects were universally recognizable and were easily related to the environmental concerns of Chinese society. Another group of motifs was derived from mythology. 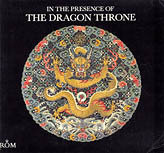 Among these were the attributes of various deities, depictions of fabulous beasts and the elements of Chinese cosmology. Although unfamiliar without a cultural context, they carried symbolic meaning directly. Inanimate items that were imbued with significance by society formed a third group that also carried meaning directly. 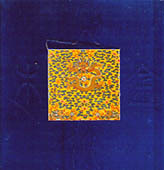 These included various forms of celebrated wealth, insignia of office and other marks of status. A fourth group featured items that carried symbolic meaning by suggestion, association or extension. Both animate and inanimate, these items bore a logical relationship to social attitudes about such things as age, success, filial conduct or marital happiness. A final group of motifs was used as rebuses for abstract words to permit elaborate symbolic messages to be expressed in concrete terms. Allied to this group was a small selection of words or characters that were used decoratively. Individual motifs were used in many ways and often had more than one meaning with the exact nuance relying upon a specific context. Motifs might be used directly to suggest a non-pictorial idea. Winter, spring, summer and autumn could be represented by the plum, peony, lotus and chrysanthemum - each reaching perfection during its particular season. However, each of these floral motifs could represent other, more abstract notions. For example, the lotus symbolized purity because of the way it rose unblemished from the mud in which it grew. In this context it was often a Buddhist symbol, one of eight motifs that were associated with this Indian religion. The combined images of lotus and egret, both spotlessly white within a marshy environment, symbolized the Confucian ideal of incorruptibility, a virtue for the government official." Many publications have devoted considerable attention to Chinese iconography. Here are a random few that both illustrate the textiles and discuss their symbolism, as well as stylistic evolution and fabric decoration techniques. Power Dressing: Textiles for Rulers and Priests from the Chris Hall Collection. Chris Hall. Singapore, 2006. Contributions by Lee Chor Lin, Zhao Feng, John E. Vollmer, Diana Collins, Szan Tan, and Wong Hwei Lian. Superb exhibition catalog with illustrations of 152 textiles. Included are many rare, early pieces that are not illustrated elsewhere, plus good sections on symbolism in the textiles. Chinese Dress. Verity Wilson. Victoria and Albert Museum, London, 1986. 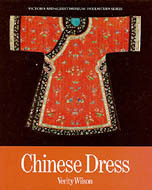 This emphasizes Chinese style and fashion in the context of the culture that produced the garments. 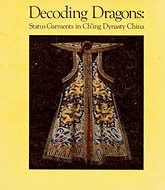 Decoding Dragons: Status Garments in Ch'ing Dynasty China. John E. Vollmer, Museum of Art, University of Oregon, 1983. Deals almost completely with the evolution of Chinese court dragon robes. 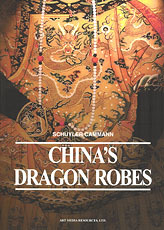 China's Dragon Robes. Schuyler Cammann. Chicago, 1952. The standard work on robe by the most highly respected authority. 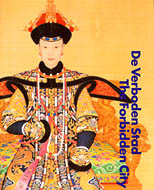 De Verboden Stad/The Forbidden City: Court Culture of the Chinese Emperors [1644-1911]. Museum Boymans-van Beuningen, Rotterdam, 1990. Court activities are the main focus, but this study includes commentaries on court dress and symbolism. Secret Splendors of the Chinese Court: Qing Dynasty Costume from the Charlotte-Hill Grant Collection. Denver Art Museum, 1981. An exhibition catalog with essays by seven specialists. 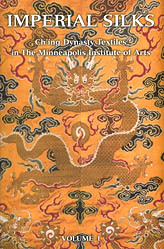 Imperial Silks: Ch'ing Dynasty Textiles in the Minneapolis Institute of Arts. Two volumes. Robert D. Jacobsen. Minneapolis, 2000. Two huge volumes with separate sections devoted to official court attire, ecclesiastical costume, theatrical costume, unofficial attire, costume accessories, furniture accessories, pictorial hangings and pile carpets. The Art of Oriental Embroidery: History, Aesthetics, and Techniques. Young Yang Chung. New York, 1979. 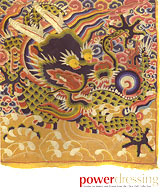 This offers comprehensive coverage of the techniques used in Chinese, Korean and Japanese embroideries. 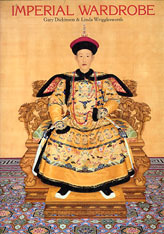 Five Colours of the Universe: Symbolism in Clothes and Fabrics of the Ch'ing Dynasty (1644-1911). John E. Vollmer. Edmonton Art Gallery, Edmonton, 1980. In the Presence of the Dragon Throne: Ch'ing Dynasty Costume (1644-1911) in the Royal Ontario Museum. John E. Vollmer. Royal Ontario Museum, Toronto, 1977. 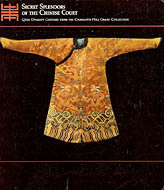 An exhibition catalog which discusses the individual pieces, but also concentrates on the evolution of the cut of Manchu garments. Imperial Wardrobe. Gary Dickinson and Linda Wrigglesworth. London, 1990. This publication focuses entirely on court costumery. 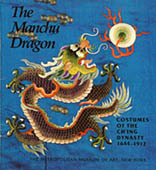 The Manchu Dragon: Costumes of the Ch'ing Dynasty 1644-1912. Jean Mailey. The Metropolitan Museum of Art, New York, 1980. A small exhibition catalog. 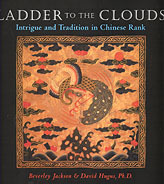 Ladder to the Clouds: Intrigue and Tradition in Chinese Rank. Beverly Jackson & David Hugus, Berkeley, 1999. An exhaustive study of Chinese rank badges. 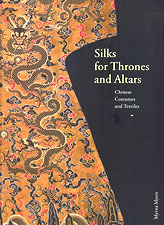 Silks for Thrones and Altars: Chinese Costumes and Textiles from the Liao through the Qing Dynasty. John E. Vollmer. Paris. Early Chinese textiles, including pieces made for Daoist and Buddhist liturgical use in Tibet and Japan. 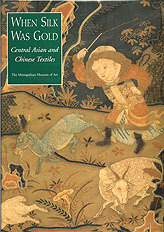 When Silk was Gold: Central Asian and Chinese Textiles. James C.Y. Watt and Anne E. Wardwell. New York, 1998. The catalog for an exhibition featuring rare, early textiles from the Metropolitan Museum of Art and the Cleveland Museum of Art. 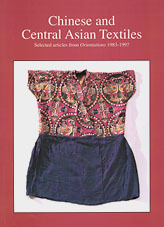 Orientations: Chinese and Central Asian Textiles 1983-1997. Orientations Magazine, Hong Kong, 1998. Assorted articles.